Suncastle Properties welcomes you to choose your ideal vacation home from along the oceanfront, golf courses or select a home with a view of the marshes along the intracoastal of Floridas Historic Coast, Ponte Vedra Beach, Sawgrass and St. Augustine. Each privately owned home is available for both short and long-term stays. Browse through our complete inventory of vacation rentals. We are confident you will find the perfect property for your next visit. Are you planning a trip for a large group of friends or multiple families vacationing together? Many of our properties are conveniently located close to one another. We have several groups to choose from within the same neighborhood - like Fisherman's Cove, Quail Point, or Spinnaker's Reach. New Arrivals! Check this page see the latest additions as soon as they are ready for you to book! Looking for a Short Getaway? How about a Golf Trip or a Football Weekend. Almost allof our homes and condos are available for 3-night rentals through-out the Summer & Fall. Check-in and check-out days are flexible. We're happy to assist you with a partial week getaway and reserve your spot on the beach. Relax and enjoy the remarkable lakefront views from this spacious Fishermans Cove condo. 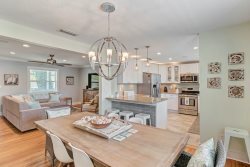 52 Tifton Cove - Light and Bright! Bright golf course home just steps from the Beach!